Ubank, the leading mobile payment app in Eastern Europe, introduced the first version of Ubcoin Market – a global peer-to-peer platform that is designed to bring 200 mln new investors to crypto. Ubcoin is an eBay-like Ethereum-powered marketplace that allows people to exchange real goods for cryptocurrency and vice versa. Ubcoin will be part of the Ubank mobile app that is pre-installed by Samsung in 10 countries and has over 16 mln installations worldwide. In July 2018 Ubank announced that it started partnership with LG Electronics about having Ubank available for LG users. The first working version of the Ubcoin Marketplace was introduced by the Ubank CEO on July, 14th in Seoul during a meetup organized by Ubcoin for its Korean contributors and potential stakeholders. At the moment the 1.0 version of the marketplace has features that were described in the company’s roadmap: creating a listing to start selling, an advanced search system, a chat establishing a real-time communication between a seller and a buyer, and the process of buying an item for UBC tokens (utility tokens for settlement of smart contacts and fees on the platform). The public beta of the platform will be available for testing at the end of August 2018. During the event in Seoul, the Ubcoin team also showed the latest updates in its own artificial intelligence system based on deep neural networks, which is designed to improve user experience, automate the processes and minimize legal and ethical risks for the business. Ubcoin Market uses machine learning techniques to moderate content, create personal recommendations, predict the price of goods, improve the quality of product images and identify suspicious ads. Ubcoin Market utilizes decentralized technologies to create an easy-to-use tool that solves problems of people wishing to enter the world of crypto investments in a hassle-free manner. Ubcoin additionally is useful for experienced blockchain market participants in need of a convenient method of spending their crypto wealth. Ubcoin Market will become an integral part of the Ubank app by the end of 2018. Korea was chosen by the Ubcoin team to be presented with the first version of the product for a strategic reason. Ubank has pre-installation agreements with South Korean tech giants Samsung and started partnership with LG Electronics about having Ubank available for LG users. Ubank is planning to start the Ubcoin Market expansion into the booming Asian market at the beginning of 2019. Earlier this year, Ubank received investment from the Singapore-based VC fund Amereus Group for the promotion of Ubcoin Market in Asia. By the end of 2018, the project is planning to open offices in Singapore, Hong Kong, and Seoul to implement the market launch strategy of the peer-to-peer ecosystem in the region. Currently, Ubcoin Market is conducting its public token sale until August 27th. Ubcoin Market is a blockchain project developing a smart ecosystem for easily investing and converting cryptocurrency by buying and selling goods. 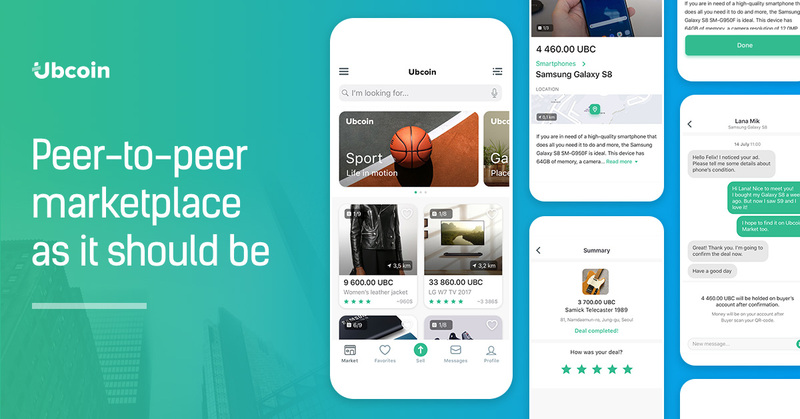 Ubcoin Market was founded by the same team that founded Ubank, the leading mobile payments app in Eastern Europe that has been working since 2009 and, as of today, has 2.5 million active users, more than 16 million downloads around the world, and has been pre-installed by Samsung and Fly. Ubank announced that it started partnership with LG Electronics about having Ubank available for LG users. To learn more about the vision and the structure of the project visit its website and read its whitepaper.